Just like the long stereotyped Italian hand signals, the French have all sorts of fun facial expressions, punctuating words, noises… as do we as I’ve learned… apparently I do some sort of hand signal all the time where I’m pointing.. not really sure? haha! 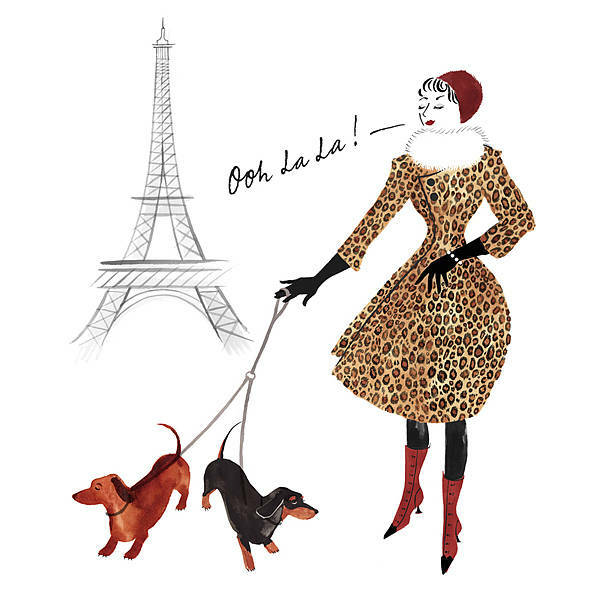 My favorite used to be “ooh la la” something we say in the States a lot to signal something posh, stylish, and perhaps slightly snobby (but almost always in a positive light). Here, when someone says “ahh la la” it’s in exasperation or frustration or to express displeasure or annoyance – the train is late, ahh la la! (usually complete with head shakes and hands in the air). There’s a long line at the boulangerie, ahh la la! I need my bread! I’ve lost my key in the gutter and a homeless man is running after me screaming! — ok that one is a bit too far. I think “Merde!” and maybe a couple other words would go more for that circumstance. But bottom line, is that “ooh la la” pronounced “ahh la la!” is not a positive thing in France signalling fashion and beautiful macaroon displays. Let’s just imagine this very fashionable looking lady was looking at the pickpockets with their clipboards shaking her head and attempting (very unsuccessfully) to hide her pearl bracelet before her dogs run away. ahh la la!!! [source] Merde! I stepped in dog poo! I first thought I was hearing Spanish. But it’s actually, this is very confusing for us, a positive response to a negative question. You know those super annoying questions that could be answered “yes” to mean both yes and no? To where, after the person has answered, you have to ask another question to clarify? I’ll be doing a couple more in the future! For a look at noises specifically, complete with voice recordings, head to Oui in France! Thanks for the shout out Molly! And I totally can relate w/the si bit. I rarely use si when I know I should. It is a little tricky! I love the ‘si’. I never use it but I appreciate it when it happens. I quite like the phrase ‘bien sur que si’ as a disagreement with a person too.